The 2016 Scarecrow Festival marked the return of the event to the county, which began on Friday and continued through Sunday. The Fayette County Republicans could be seen all weekend. 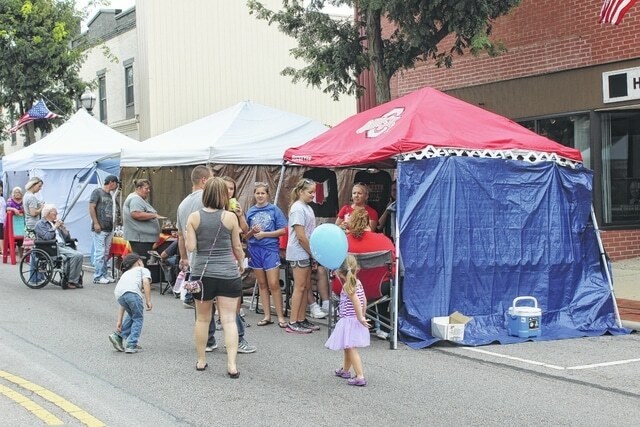 The Fayette County Democrats had a presence at the Scarecrow Festival, and also opened their headquarters for residents to join them on Saturday. 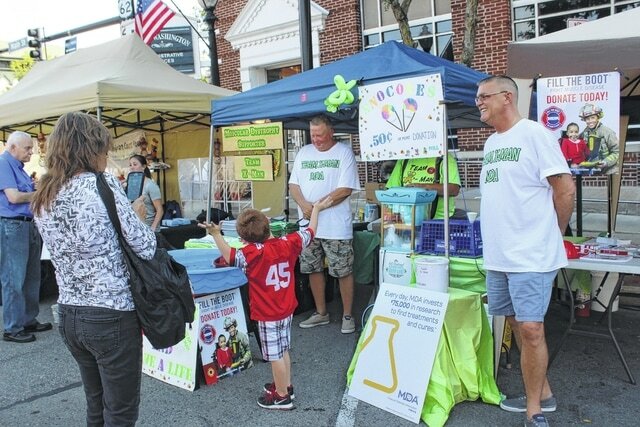 Team X-Man, Muscular Dystrophy Supporter, helped to raise money to combat the disease. Uncle Mike’s Donuts served homemade sweets and offered free samples. The 2016 Scarecrow Queen Allison Fullmer (left) and one of her attendants, Renee Newland, could be seen throughout the weekend at the festival. 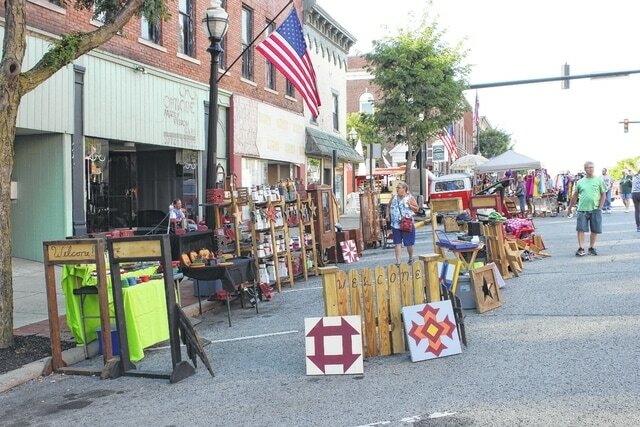 A number of vendors were selling many items, from clothing to baby necessities to honey and wooden creations. 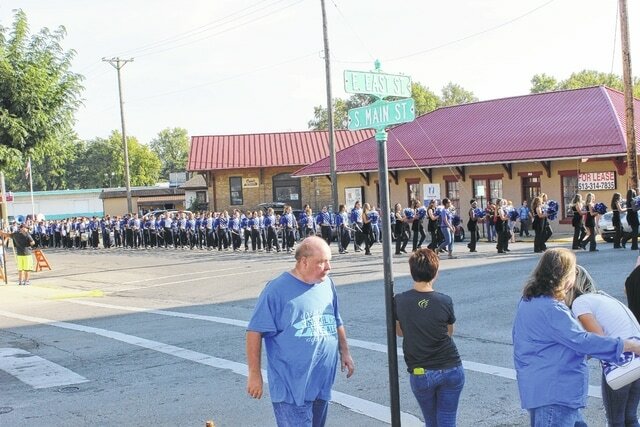 The Washington High School Blue Lion Marching Band visited the festival Friday evening to play for the crowd. Richard Lynch and John Crabtree played Friday evening at the festival. 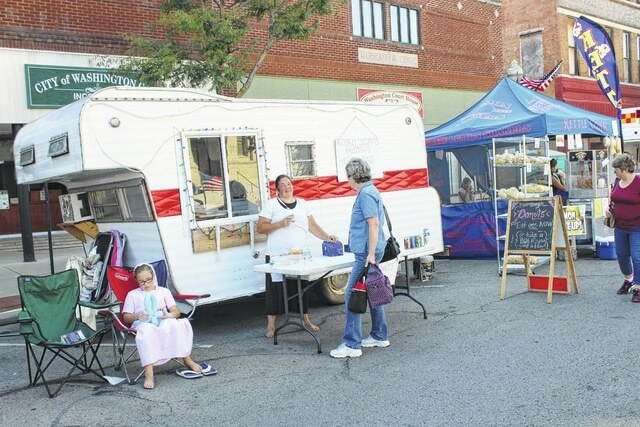 Other vendors included churches, businesses and more. 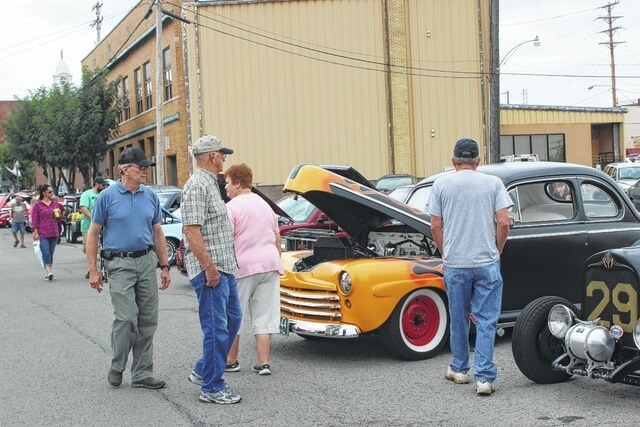 A car show was held Saturday morning and dozens of vehicles were on display for residents to enjoy. 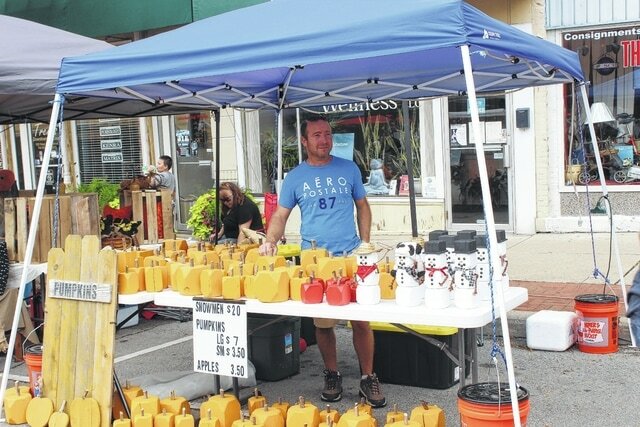 Some vendors had seasonal items, including pumpkins, snowmen and other home decorations. The Spirit of Truth booth was accepting donations and selling some handmade items, while also passing out information about their church. 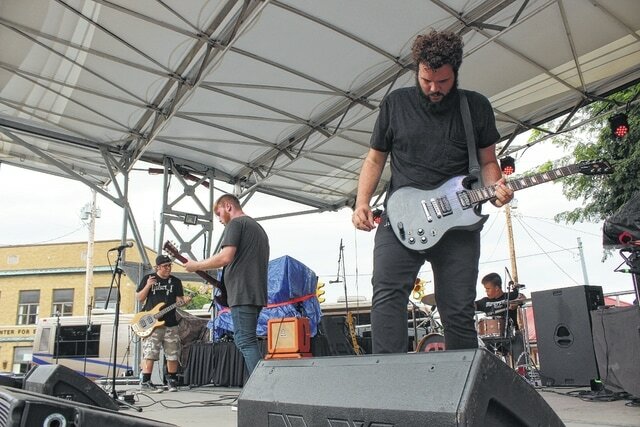 DERAILED performed Saturday afternoon with a more rock/metal sound than the other performers. 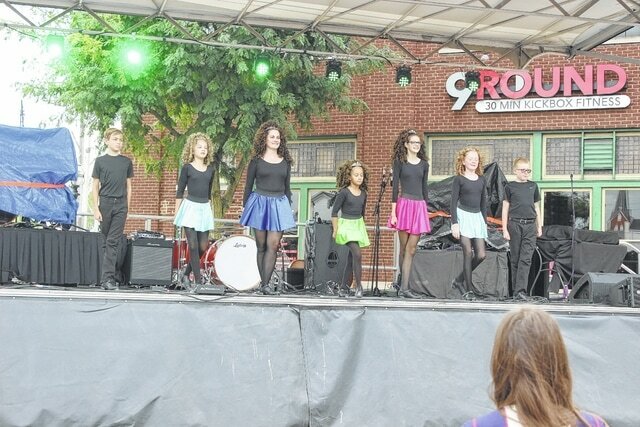 Irish dancers traveled to the festival to perform some traditional Irish dances. 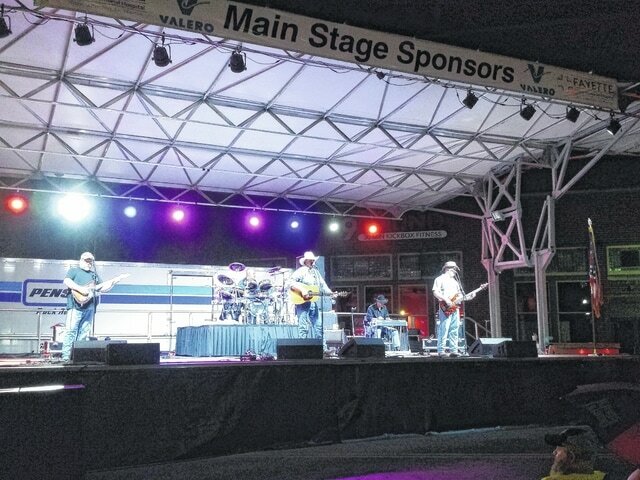 Adam Garman, a Fayette County native and comedian, performed for a crowd of about a couple hundred Saturday evening prior to the evening headliner. 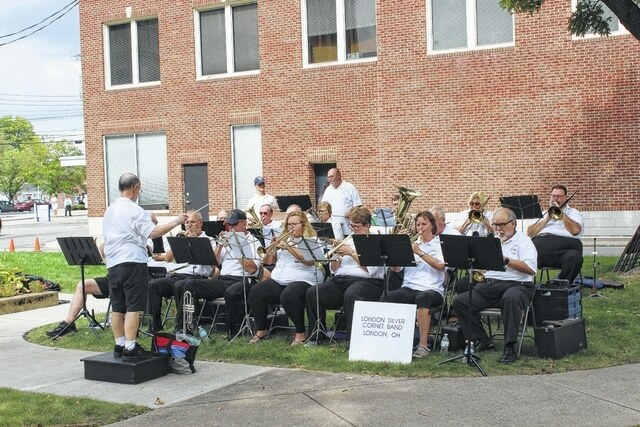 The London Silver Cornet Band performed on the courthouse lawn throughout the last couple hours of the Scarecrow Festival Sunday afternoon. The group takes historical music and couples it with interesting story telling from the time period of each tune. https://www.recordherald.com/wp-content/uploads/sites/27/2016/09/web1_ScarecrowFestivalRepublican.jpgThe 2016 Scarecrow Festival marked the return of the event to the county, which began on Friday and continued through Sunday. 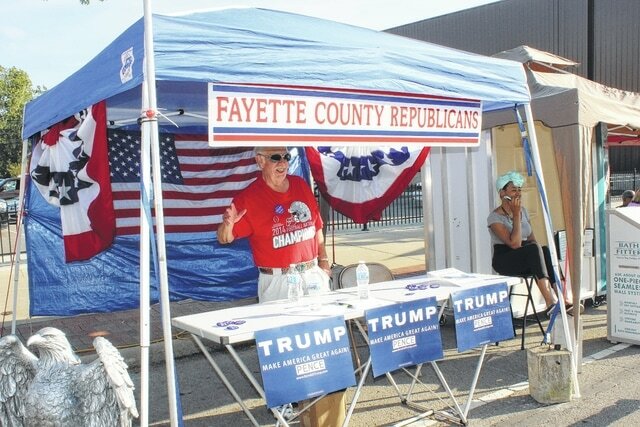 The Fayette County Republicans could be seen all weekend. 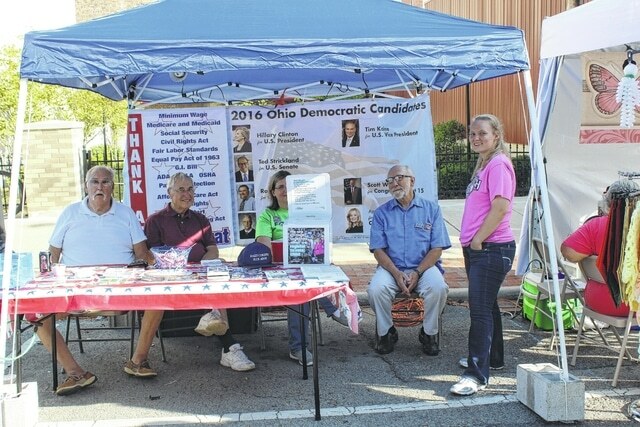 https://www.recordherald.com/wp-content/uploads/sites/27/2016/09/web1_ScarecrowFestivalDemocrats.jpgThe Fayette County Democrats had a presence at the Scarecrow Festival, and also opened their headquarters for residents to join them on Saturday. https://www.recordherald.com/wp-content/uploads/sites/27/2016/09/web1_ScarecrowFestivalMDA.jpgTeam X-Man, Muscular Dystrophy Supporter, helped to raise money to combat the disease. https://www.recordherald.com/wp-content/uploads/sites/27/2016/09/web1_ScarecrowFestivalDoughnuts.jpgUncle Mike’s Donuts served homemade sweets and offered free samples. 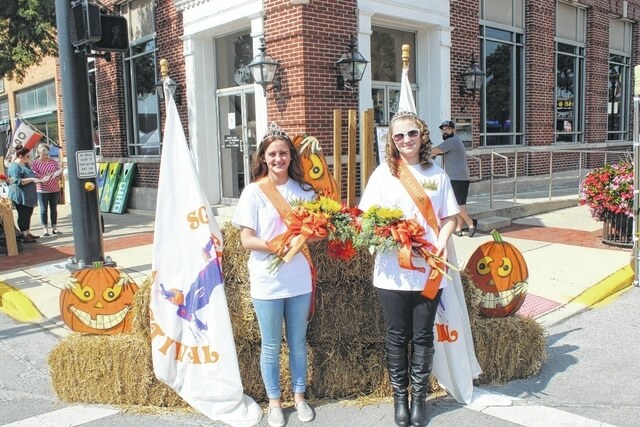 https://www.recordherald.com/wp-content/uploads/sites/27/2016/09/web1_ScarecrowFestivalQueenandAttendant.jpgThe 2016 Scarecrow Queen Allison Fullmer (left) and one of her attendants, Renee Newland, could be seen throughout the weekend at the festival. https://www.recordherald.com/wp-content/uploads/sites/27/2016/09/web1_ScarecrowFestivalVendors2.jpgA number of vendors were selling many items, from clothing to baby necessities to honey and wooden creations. https://www.recordherald.com/wp-content/uploads/sites/27/2016/09/web1_ScarecrowFestivalMarchingBand.jpgThe Washington High School Blue Lion Marching Band visited the festival Friday evening to play for the crowd. https://www.recordherald.com/wp-content/uploads/sites/27/2016/09/web1_ScarecrowFestivalRichardLynch1.jpgRichard Lynch and John Crabtree played Friday evening at the festival. https://www.recordherald.com/wp-content/uploads/sites/27/2016/09/web1_ScarecrowFestivalVendors.jpgOther vendors included churches, businesses and more. https://www.recordherald.com/wp-content/uploads/sites/27/2016/09/web1_ScarecrowFestivalCarshow.jpgA car show was held Saturday morning and dozens of vehicles were on display for residents to enjoy. https://www.recordherald.com/wp-content/uploads/sites/27/2016/09/web1_ScarecrowFestivalSeasonal.jpgSome vendors had seasonal items, including pumpkins, snowmen and other home decorations. 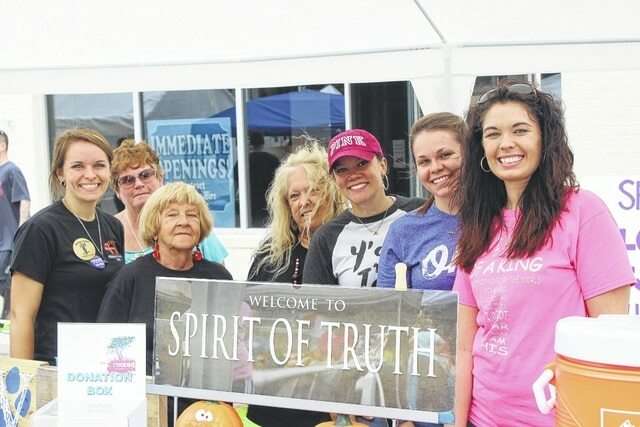 https://www.recordherald.com/wp-content/uploads/sites/27/2016/09/web1_ScarecrowFestivalSpiritofTruth.jpgThe Spirit of Truth booth was accepting donations and selling some handmade items, while also passing out information about their church. https://www.recordherald.com/wp-content/uploads/sites/27/2016/09/web1_ScarecrowFestivalDerailed.jpgDERAILED performed Saturday afternoon with a more rock/metal sound than the other performers. https://www.recordherald.com/wp-content/uploads/sites/27/2016/09/web1_ScarecrowFestivalIrishDancers.jpgIrish dancers traveled to the festival to perform some traditional Irish dances. 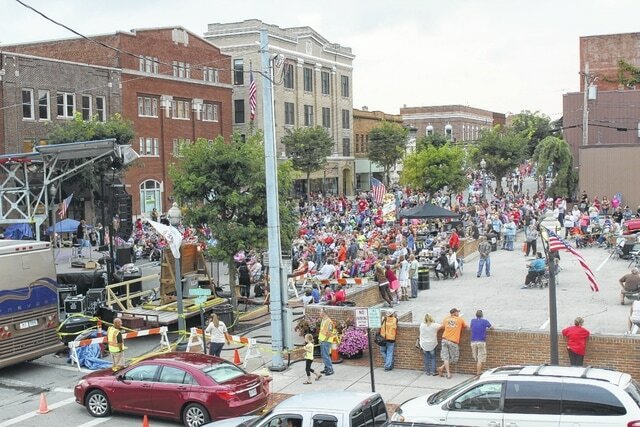 https://www.recordherald.com/wp-content/uploads/sites/27/2016/09/web1_ScarecrowFestivalAdamGarminCrowd.jpgAdam Garman, a Fayette County native and comedian, performed for a crowd of about a couple hundred Saturday evening prior to the evening headliner. https://www.recordherald.com/wp-content/uploads/sites/27/2016/09/web1_ScarecrowFestivalLondonSilverBand.jpgThe London Silver Cornet Band performed on the courthouse lawn throughout the last couple hours of the Scarecrow Festival Sunday afternoon. The group takes historical music and couples it with interesting story telling from the time period of each tune.